Esri ArcGIS Integrations | AGL | Applied GeoLogics Inc.
Each ArcGIS integration configuration Cartegraph supports is detailed below. 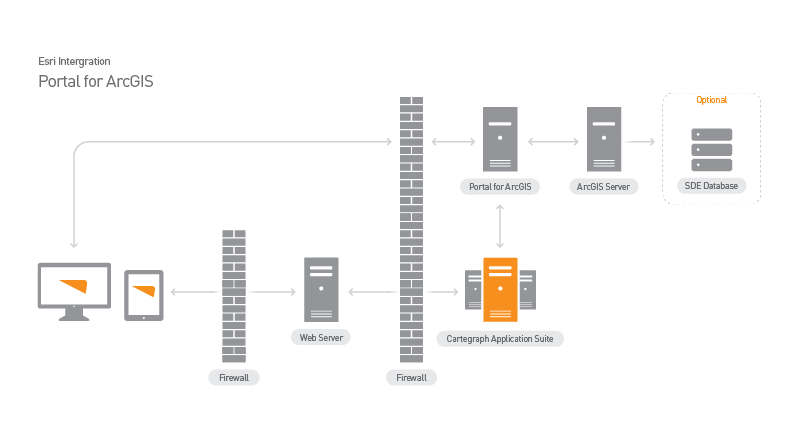 The Cartegraph Administrator application workstation. Any ArcMap workstation editing GIS data that is integrated with Cartegraph. 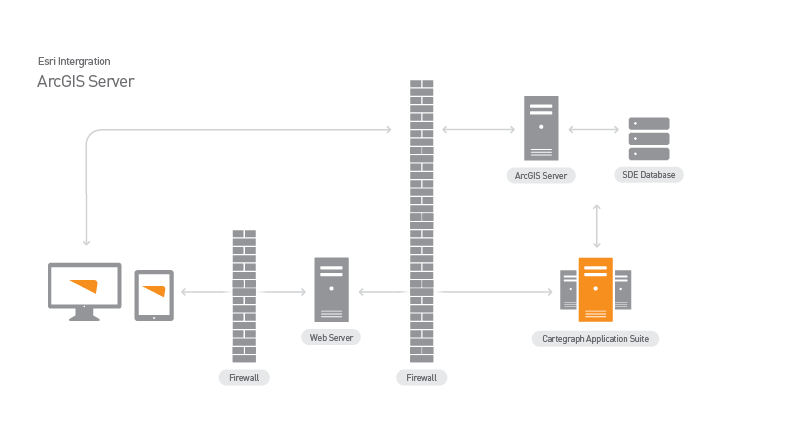 The Cartegraph Application Server manages the Cartegraph database. It also reads and writes GIS data through the ArcGIS server to keep the and GIS databases in sync. It must be accessible from the Cartegraph Web server. 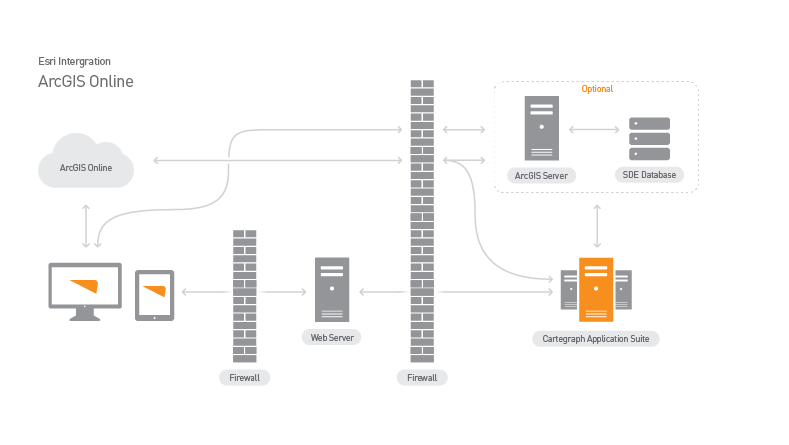 For a two-tier installation the Web server does the Application server functions. Cartegraph Database server houses the Cartegraph database in a SQL Server database. It must be accessible from the Cartegraph Administrator application workstation. and Cartegraph Application server. ArcMap Workstations are the workstations where GIS users edit GIS data with ArcMap. Along with ArcMap, the workstation must also have the Cartegraph ArcMap Add-in installed. As GIS data is edited in ArcMap, the add-in component communicates with the Cartegraph Web server to keep the Cartegraph database in sync with the geodatabase. An optional configuration uses ArcGIS Online in conjunction with ArcGIS Server for Windows. This server publishes the GIS data, provides access to the data from the Cartegraph environment. It has two installed components: ArcGIS for server and the Cartegraph SOE (Server Object Extension). These components expose the GIS data as RESTful URLs, which must be accessible from the Cartegraph Application server. The ArcGIS server’s URLs must be accessible from the internet so the Cartegraph cloud can access them.